(Front) Jessie Bennett, Kate Beaman, (on knees) Kaitlyn Boyce, (standing) Sarah Phillips, Bradyn Toney, Kylie McKee, Jenna Jones, Maddie Varvel, Brittney Birt, Taylor Pruitt, Kendra Boyce, (left to right) Jason Jones, Tim Phillips and Shane Boye. 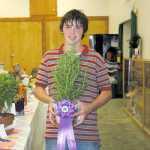 Edie Campe photo Logan Maybaugh received the Grand Champion ribbon for the herb gardening category. He will be in 9th grade this fall.